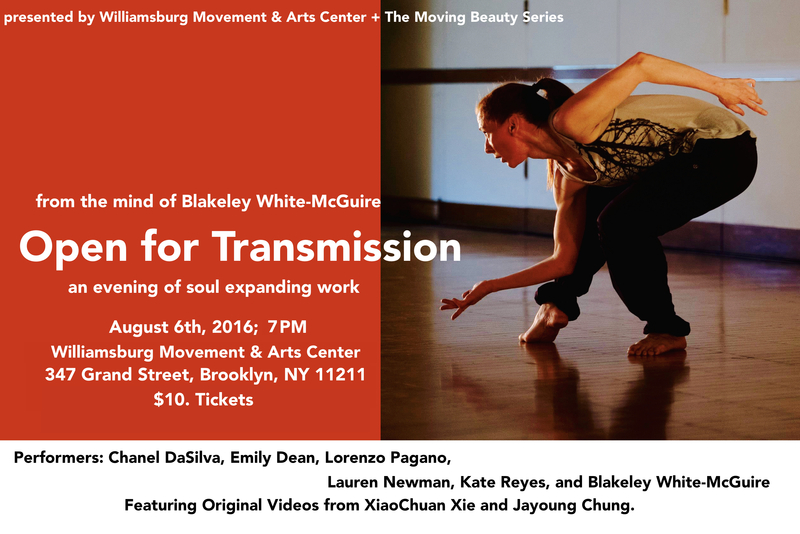 The Moving Beauty Series proudly returns to production with Blakeley White-McGuire’s “Open for Transmission”. Ms. White-McGuire invites you to this captivating evening of dance and spoken word. Using the power of beautiful bodies in motion and innovative audience engagement, “Open For Transmission” will stimulate your mind and transport your spirit to a new dimension. It’s all in the name of fost… See More — with Chanel DaSilva, Emily Dean, Lorenzo Pagano, Lauren Newman, XiaoChuan Xie, Kate Reyes, Blakeley McGuire and Jayoung Chung. Next PostNext October 30th, 2016 – New site-specific dance to premier at Outlet Dance Project.